Good Tuesday Tutorial morning to you! This is Lisa. Yes, you get me back to back. Hope you liked the sponged cloud tutorial and free templates. If you are wondering what I'm talking about here's the link to my last tutorial SPONGED CLOUDS. Today I am showing you ways to use two of the latest SVG files for the holidays. I will be sharing a recipe of a yummy treat for gift giving and perfect for filling our templates. I'll show you how a tip for making this LANTERN SVG into a real Lantern. And how to make an advent for your children and friends using this adorable CHOO CHOO TRAIN SVG. This is the yummy recipe I am sharing with you today. You have to try them. They are so easy to make and sooooooooooo yummy. Everyone will love them. Kids will love to help. They work perfectly for gift giving and filling your handmade treat containers. Preheat oven to 300. Place Pretzels on baking sheet. Top each pretzel with an unwrapped rolo candy. Bake in oven for 3 minutes. Quickly remove from baking sheet to cold waxed paper lined baking sheet. Top each with another pretzel pressing down. Place in refrigerator for 30 minutes (they should not be shiny). Place in air tight container. Store at room temp. I put them in a clear treat bag and tied with STRAWBERRY JAM SATIN RIBBON. I attached this tag I made using STRAWBERRY JAM CARDSTOCK and BAKED FOR YOU TAGS. NOW ONTO OUR ADVENT CHOO CHOO. We'll start with making these so cute little tags for your advent Choo Choo. All you do is size these tags to the size you want, mine are 3/4 x 1 1/4 using this new color digital image CHRISTMAS CUTIES TAGS. I printed them out on COTTONBALL WHITE CARDSTOCK. I just insert the image I want into Microsoft Word. Then I right click on the image to see the size of it. I select size and it tells me the size. So cool. I love these too besides them being soooooo cute, but you can cut right along the tag outline. How cool is that! Cute them out and punch a hole in the circle on the tag using a 1/16" hole punch. I wrote in the numbers 1 - 24! You can use these as dates or as a count down. I made this tag for Christmas Day using the digital image CHRISTMAS CUTIES COLOR. I made my tag in Microsoft publisher. It allows me to put images close together. My tag is about 1/2 by 2". Now just tie on your tags using STRAWBERRY JAM DIVINE TWINE (8" long for each for my candies I used...Andes Peppermint Crunch candies). Now I filled my assembled CHOO CHOO TRAIN SVG with my advent candies and tags. I put the Merry Christmas one in first in the passenger car up to 15 then started with 14 in the locomotive and finished with candie 1 on the top for pulling each day keeping with the dates of the month. Here is one side of the lantern cut out. Then I cut out a piece of Vellum Cardstock without a hole in the middle. To do that in your cutting program you have to remove the middle before cutting. Place score tape close to the inside and outside edge. This is necessary because the vellum will buckle if you don't adhere close to the inside edge and you need to adhere close to the outside edge so when assembling the box, it will be secure. Here is it adhered. Trim any excess vellum that shows on the outside edge. When assembled completely place a battery candle tea light or votive. I got mine at JoAnns. It even flickers like a real candle. Please note my sample is bigger than yours will turn out. Why? I used the pdf file that came up in my cutting program by mistake and it came out bigger. The top and bottom did not fit because of it and I had to make these myself. So these trees fit perfectly on mine because of the size difference. I used the digital image PAPER TREES (pre-colored). This lovely version of the lantern is by Stacy Morgan. She also designed these templates. Isn't she a clever girl! Her tag is using ANTIQUE ORNAMENTS. Here is Stacy's Christmas Train. Decorated with HOLIDAY NUTCRACKERS. Stacy's Birthday Choo Choo is absolutely adorable! Banners are from BIRTHDAY PARTY. Hi. Lisa here. I hope you are enjoying your holiday weekend. Here's another tutorial for you. There's been some requests for this technique. We have something special for you....below you can download the cloud templates for this project and technique FREE. This tutorial will show you how to make this project using the sponged cloud technique and above templates. Click on Cloud Template link above. Right click and select SAVE AS....choose where you want to save it. Print it out onto copy paper. Cut out both pieces. 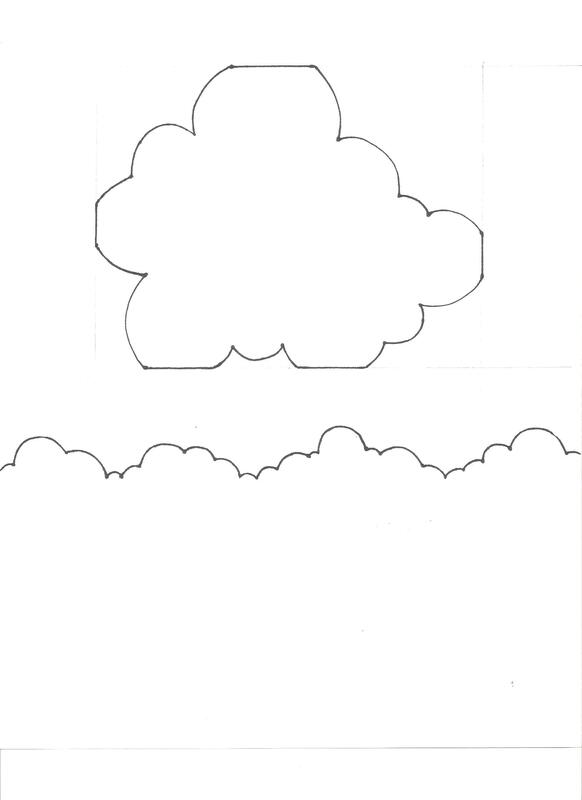 The top cloud is for your card template... to make a cloud shaped card. The bottom clouds is your border for making the sponged cloud background. Set aside. Cut a piece of COTTONBALL WHITE CARDSTOCK to 8 1/2 x 5 1/2. Score at 4 1/4 along the long side using your SCOR-PAL. Using post-it notes mask off the other half of the card by placing the notes along the fold line. That leaves the card front clear for us to sponge our cloud background on. On the back of the cloud sheet, place removeable tape all along the edge of the clouds. That way when you are sponging the clouds the template stays in place. Place your template at an angle just about a third of the way down your card from the top. Using TROPICAL MIST PALETTE INK PAD and a Tim Holtz Blending Tool ink your tool pad. Next rub in a circular motion on your template a few times then rub onto the card front keeping in a circular motion. By doing this you get the heavy ink off and rub on the template edge of the card with minimal ink. This way you don't get harsh marks on your card. You just layer to get the color you want. This may take a little practice to get used to it and achieve the look you want...it did me. I recommend practicing on a scrap sheet firt til you get the hang of it. Now move your template up above where you just finished at an angle the opposite way this time. See how it's shaping up! Now we are ready to fold our card and use our cloud template to make our cloud shape. Line up your cloud template on your card front and trace lightly with pencil. Now cut out your shape going through both front and back of your card to make a cloud shape card. Now to add a finished look sponge the edges. Now stamp two balloons using HOT AIR BALLOON and MEMENTO TUXEDO BLACK INK PAD. Next stamp a hot air balloon using CHERRY GO ROUND PALETTE INK PAD on a separate piece of COTTONBALL WHITE CARDSTOCK. Cut out and sponge the edges. Place dimensional tape on the back. Place the red balloon on the card front. Stamp the sentiment LET YOUR FAITH SOAR. HERE ARE SOME MORE IDEAS USING THESE TEMPLATES. If you use the templates I'd love it if you'd leave a comment and link to your creations! I'd love to see what YOU create. Thank you. We have a winner for our Sunday Blog Hop! Carla of Carla's Stamping Spot, chosen from Sara's blog, Sara's Sugar and Spice. Please contact Cassie at cassandratrask@yahoo.com to claim your $25 gift code for digital images! Tuesday Tutorials were Katie's ideas, Katie's inspirations, Katie's little brain child. She was so good at coming up with little gift ideas and things created so easily, but so stunning in the end. I always checked first thing on Tuesday mornings to find out just what clever thing Katie had done that day. Katie began a long string of tutorials that both inspired us and challenged us to create simple yet lasting crafts to touch other's lives. We, the CDS design team, felt we needed to do one more walk down Tuesday Tutorial Lane with Katie. We have let her past creations inspire us and create the Celebrate Life Blog Hop you are about to enjoy. When Katie found out she had Stage 4 stomach cancer in December, she called me to let me know right away. I was in my car driving my daughters to gymnastics. I still remember the blackness around me and how it just seemed to get darker in that one moment. I just didn't even know what to say. I choked back tears as I assured her I would cover her in prayers. Thus, began the many months of mourning for my Katie....my friend, my encourager, my advice giver, my right hand girl. Katie would call to check on most of us during the last 11 months...make sure we were ok and talk us through our pain. What a special person she was. She has inspired me to be a better friend and mom in so many ways....to make sure every moment counts. This blog hop is dedicated to the loving memory of our Katie. We decided as a Design Team that we should "case" or be inspired by a card or project that Katie did for this blog hop. I just have so many little memories of her "favorites" that I decided that I would create a card using as many of Katie's favorite things as I could! So here goes! She searched this cardstock out herself, found one she said "wasn't too heavy, wasn't too light, but just right!" The next thing that I knew I had to add was patterned paper. She loved patterned papers! I chose one that had lots of colors that I knew she would like! I mixed them up and gave it lots of patterns....I know she would like this! I used three papers.......just like Katie! Here is Katie's sample using three papers....see told you she liked patterns! The next item that Katie really loved was the Designer Label Dies - Set of 3....she used it on many of her cards. The Designer Label Accent Clear Acrylic Stamp that is stamped around the Merry Christmas sentiment was a stamp that Katie just insisted that we needed...she said that it just didn't look complete without it having a stamped frame around it! It took me a while to make it for her, but she never quit reminding me! I think of her every time I use it! The next item that had to be on the card was a crocheted flower....no card would be complete without Katie's hand crocheted flowers. Each and every one made by Katie. Here is layer one....with the contrasting patterned paper glued to the front and cardstock glued to the back of the clear cardstock to cover the tape. Layer number three has a hidden place to write a note to your friends and family or stamp whatever sentiment you would like! Layer four is a little band to hold the card shut.....ta-da! A totally Katie inspired card! Now if I were Katie, I would make tags and a gift box to match out of the clear cardstock! I feel like I've been friends with Katie all my life when in fact it has just been several years. Katie is just amazing. You meet her, her love envelops you, and she becomes a part of your life. She's warm, kind, caring, and just makes you happy. Her smile brightens your day. When I saw the bear with the heart, I knew it was the image I wanted to use for this blog hop because it just reminds me so much of her -- a heart so big that her love pours out on everyone. Katie taught me that we never know how long we will be on this earth so we need make the best of the time we have. Katie taught me to slow down, look around, and enjoy life. Katie taught me how to be a better friend, wife, and mother. Katie taught me how to be a better person. Katie taught me to stop and smell the roses. The quote on this card is Katie. She touched so many people and made a difference in so many lives. Katie is the world to so many people including me. Continue to help us Celebrate Katie's Life....hop on! Live every moment like it is your last! WINNER: The winner will be randomly chosen from comments received on DT member blogs. The winner will be announced on the CDS blog Thursday, November 24th (Thanksgiving). FAITH IN GOD and my TRUE FRIENDS. I have been blessed with so many friends that I can count on to pray for me and be there when I need them. Thank you to all my wonderful friends! I am so thankful that I am saved by faith, that I have accepted God's free gift of salvation and that I don't have to struggle to be "good enough" or do "enough good deeds" to get to heaven. I just have to accept Jesus in to my heart! I am so THANKFUL to God for this gift! "For by grace you have been saved through faith; and that not of yourselves, it is the gift of God. Not by works, lest any man should boast." This sample below is for one of my best friends. We are prayer partners and right now she is struggling with some things....so I reminded her to have faith that God will answer her prayers! Let's go look and see what my other DT members did with these new colors! We have new specials starting today! What's the special right now? AFTER you put in your credit card information. Happy Friday everyone! It's Cassie here for another Clearly Inspired Challenge. . .#40! We want to see you use some flowers. . .as your main image, on your papers, just be creative. Please use Mister Linky below to link your project directly. 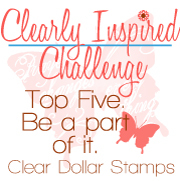 We also ask that you link back here to Clearly Inspired Challenges sponsored by Clear Dollar Stamps. You have until December 1st at midnight to enter this challenge to be eligible for the prizes at the end of the month. Be as creative as you can while sticking to the theme. We can't wait to see what you come up with! November Digi Day at Clear Dollar Stamps! Once again, it is digi day at Clear Dollar Stamps....the day where we can instantly have what we see....what could be better! We have a fabulous lineup this month with new digis, plus we are moving some of our past stamps to digi format! Are you new to digis? Well if you are, here is a quick explanation. You will buy and download a "zipped up" file. You will unzip this file and receive all the images in jpg and png formats. You will then pull those into a Word doc or picture editor and print, print, print. First, we have this gorgeous colored ornament set for Christmas....and you could even stretch it in to a Valentine's card if you would like! Colored papers are also included! Gorgeous cards in minutes! Designed by Laurie Wilson, Clearly Delightful. Copyright Clear Dollar Stamps. Are you a fan of The Twelve Days of Christmas? You will be once you see this adorable digi! Fully colored, or not, if you want to color it yourself, you can create some bright and festive cards quickly and easily with the image and papers to match! This set of trees by Trudy are simple, yet classic. Perfect for gift tags or bags, cards or scrapbook pages, this set is a must have for your Christmas collection! Easy to trim out and layer to create stunning craft projects! Design and copyright Trudy Sjolander, True =D Doodle Designs. Don't you just love this set? It will be close to your heart as you discover how quickly and easiily this set converts into Holiday cards! When Trudy sent me this colored digi image, that is all that I could say....WOW! The detail in this are just unbelievable and sure to be a favorite with every cat lover you know! This set is just perfect for so many occassions....a must have for your collection. Tweens will love the lava lamp, Grandma will love the stained glass, and dad will love the oil lantern! Can you get more versatile than that....I think not! Design and copyright Deedee Anderson. Licensed by Clear Dollar Stamps. That's right! All of these have been stamps....some are still available as stamps, and some are not, but you don't want to miss out on these favorites! This little guy looks like he is trying to get away for the Thanksgiving Holiday....what do you think? Illustration by Laurie Wilson, Clearly Delightful. Copyright Clear Dollar Stamps. I think the hunters in your life will find some humor out of a care package labeled with a hunting turkey....don't you! Illustration by Heather Rolin. Copyright Clear Dollar Stamps. Would you like it in a stamp? Beautifully colored and accessorized with digi papers, this set will make up in to a nice gift to give some friends cards to spread the real meaning of Christmas! Can't you just see these cute little digi image covering your scrapbook pages and cards? All those kitty lovers in your life will just think you're the best! What about a count down calendar adorned with a Christmas kitty for your kids? Illustration by Shawne Arnold. Copyright Clear Dollar Stamps. This set has always been one of my favorites! Joy and Jolly are easily spelled with these images...so cute! Here is a simple little manger scene perfect for use with little kids and Sunday School cards! Designed by Lori McCroskey, Clear Dollar Stamps. Isn't this just the sweetest little angel? She would make cute ornaments or be adorable on shrink plastic to make jewelry! Size it up for cards or down for tags! Leave some comments to let our illustrators and designers know what you think! Wow, all wonderful months for this upcoming new year! If I had this awesome set, I would make calendar sets like Karen - using the acrylic frame and give them as extra little Christmas presents to my friend and family!! Thanks for sharing! Winners please contact Cassie (cassandratrask@yahoo.com) to claim your prize!